3 Audio CDs loaded with over 2 hours of life changing information. No, what we angry men need to do to start our journey of healing is to learn to “SHUT UP!” That means no profanity, name calling, raising our voice or sometimes not talking at all when the anger is churning. We can learn to keep the lid on our pressure cooker and turn off the fire and let the steam turn back into cool water. 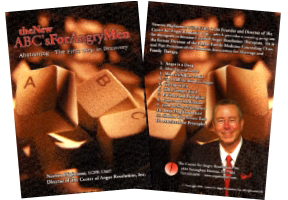 The New ABC’s for Angry Men has helped thousands of men to save their marriages when wives and their therapists had given up. These CD’s have behaviors you can do that your wife will notice right away! Get started now! Newton Hightower, LCSW, CART, is the Founder and Director of The Center for Anger Resolution, Inc., which provides a training program for therapists to become Certified Anger Resolution Therapists. He is the former Director of the Baylor Family Medicine Counseling Clinic and Past President of the Houston Association for Marriage and Family Therapy.